When walking to the grocery store, and expecting to carry back a hefty load, I usually leave camera behind—as was the case this morning. So I had to rely on iPhone X when meeting Lola and her owner, along Polk Ave. between Georgia Street and Park Blvd. 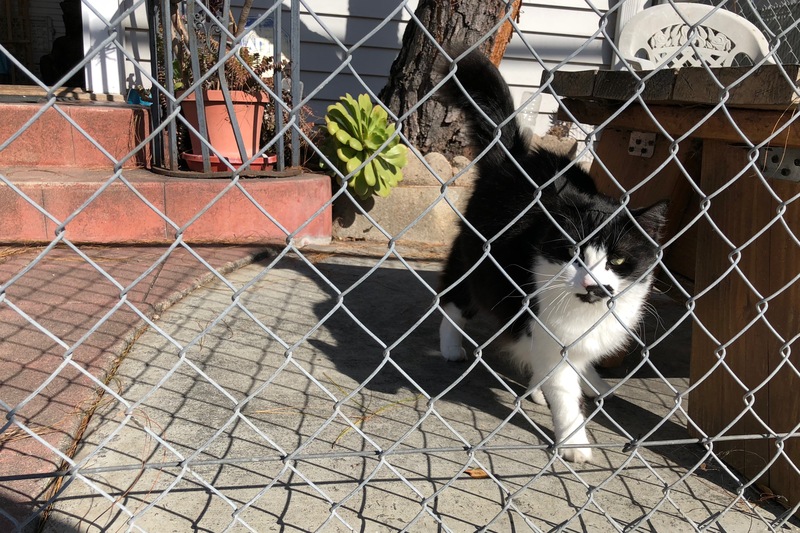 As I trudged up the hill, a lady approached her property fence to the sounds of a meowing cat greeting her from behind a mesh-like security door. 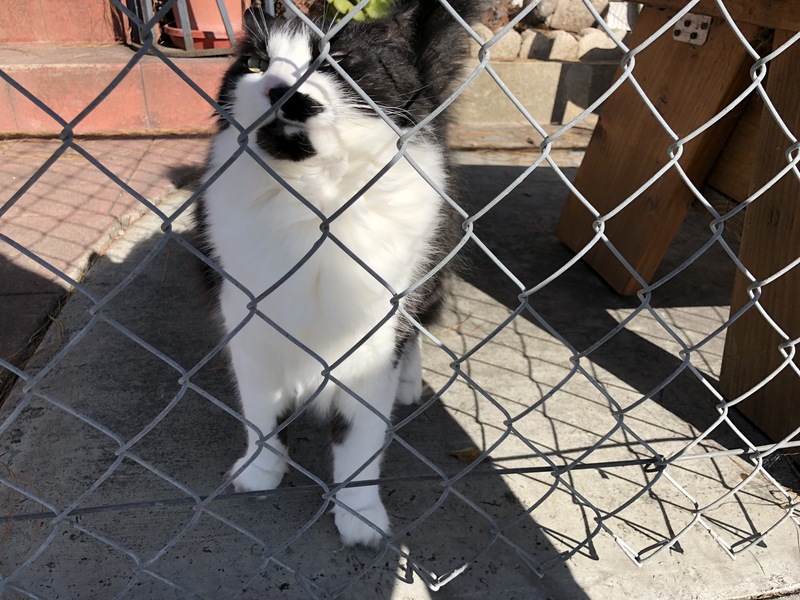 I asked about her kitty, who came out into the small yard and promptly attacked a grey furball that neither of us humans had seen. The intruder immediately fled, and Lola returned to rubbing against anything and everything, issuing sweet meows. The pretty kitty is a two-and-a-half year-old rescue, and the caretaker says she is friendly with humans but hostile to other cats (as I observed firsthand). The Featured Image and its companion do not adequately showcase Lola’s lush, fluffy tail. She simply is gorgeous, and perhaps a future photo opportunity will let me show you how much. Vitals for the first: f/1.8, ISO 20, 1/1548 sec, 4mm; 10:25 a.m. PST. Second: f/1.8, ISO 16, 1/1116 sec, 4mm. Also in this series: Scruffy, Roly Poly, Woo, Skull, Biscuit, The Colonel, White, Chipper, Frisky, Stretch, Needy, Farfisa, Mates, Hunter, Pee-Pee, Blue, Blue Too, Bonded Pair, Patience, Fess, Jumper, Frenemy, Looker, Cozy, Scout, Lurks, Skit, Mini, Betty, Black and White, Stalker, Bell, Chill, Sammy, Scratch, Poser, Star, Grey and White, Watcher, Herman, Comet, Roman, Willow, Chub, Nimbus, Watson, Lilo, Kit, Pepe, Twilight, Sebastian, Spot, Booger, Ash, Veruca, Riley, Mellow, Bonde, Flower, Glass, Black, BeBe, Fang, Bruce, Siamese, Pounce, Tortie, Haiku, Fraidy, Peso, Daniel Tiger, Dusk, Stride, Dainty, Spry,Tabby, Betty Too, Still, Levi, Shadow, Sophie, Wink, Ferals, Momma, Charlie, Tux, Cool, Benny, Jellicle, Itchy Valentino, Goldie, Nine, Amanda, Siesta, ChaCho, Charlie, Too, Mika, Crystal, Seeker, Mittens, Dancer, Smokey, Monkey, Captain Blackbeard, Season, Maven, Tink, Chunk, Curious, Hanoi, Bella, Tarry, Guido, Maxine, Mr. Kitty, Peohe, Panda, Frankie, Sunshine, Twain, Willow, Too, Brawn, Reddy, Burglar, Laramie, Lupe, Bright, Tom, Charm, Buddies, Boss, Ohana, Seer, Fresh, and Token.